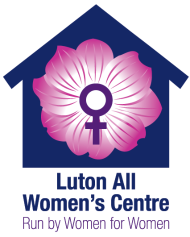 Luton All Women Centre is dedicated to meeting the needs of all women in Luton and surrounding areas. The centre provides support and advice on a variety of issues including Domestic Abuse, Welfare Benefits, Parenting, we also have a Young Women’s Service , a specialist service on Forced Marriage and Honour Based Violence and a Counselling Service. We run weekly support groups, these include Revive, for women who suffer from anxiety, depression or social isolation. We run Hope for women who have suffered childhood sexual abuse, we also run a weekly coffee morning, open to all! We also run a fortnightly legal surgery in partnership with a local solicitors’ firm and have a weekly advice surgery delivered in partnership with LAN. We regularly run Freedom Programme: a recognised programme for women who have or are experiencing Domestic Abuse. This programme aims to empower women by giving them the knowledge of all the various forms of domestic abuse. We deliver Triple P: One to One accredited Positive Parenting Programme that aims to help mothers to manage their child’s behaviour more effectively. Throughout the year we run recreational and educational courses for women, check our website for more information. Counselling Service - We offer a supportive, confidential and safe counselling service. Craft, coffee and cake - Will include the following activities: Card Making, Cake Decorating, Painting, Sign Making, Stamp Making, Paper Machê, Stencilling, Play-Dough, Scrap Booking, Creative Drawing and Photography. Day Programme - is designed for 11-25 year olds. "A unique multimedia programme that uses short films, advertisements and chart music to raise awareness about Domestic abuse & Child Sexual Exploitation"
Freedom - To provide an opportunity for women to develop ways of thinking and acting to protect themselves, their children and others from harm; in a safe group environment. Also available in Polish. Hope - A support group for women who have experienced childhood sexual abuse. Our Lives - is a freedom type programme delivered in a confidential environment to discuss the every day experiences and challenges in the lives of South Asian women.